So, you’ve decided to take the plunge and schedule your 3D ultrasound to get a glimpse of your baby before your due date. In our Boardman, OH 3D 4D Studio we see how exciting it is for the family to experience this! Who wouldn’t love the chance to see their baby’s button nose, pouty lips, and chubby cheeks? But, if you want images clear enough to fight over who he or she looks like, follow these tips for getting the best 3D/4D ultrasound images of the newest member of your family. Drink, drink, drink… water, of course! 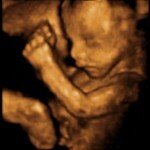 3D/4D ultrasound technology relies on mom having enough amniotic fluid around baby’s face to get a clear picture. Too little fluid results in baby’s face touching one of the surfaces in the womb, such as the wall of the uterus or placenta. If baby’s face is actually touching these objects, the ultrasound machine can’t tell the difference, and the result looks more like a blob than a baby. When this image turns, you can see some things in front of baby’s face. We still got a great image because they weren’t touching the baby’s face, as you can see. The amniotic fluid between the face and everything else is why we were able to get a great image. The only way to increase amniotic fluid levels is to stay well-hydrated. In addition to the many health benefits of adequate water intake, drinking a lot of water will more often than not results in some amazingly detailed ultrasound images! Water is the best way to stay hydrated. Coffee and tea just don’t seem to give us the same results as we get with moms who drink a lot of water. And this is especially important during the summer months, when we all tend to get a little on the dehydrated side. A lot of our moms have heard or read the advice to drink orange juice before their ultrasound appointment. Orange juice is quite the magical elixir in the ultrasound world. Even if a mom has a ton of amniotic fluid, if baby has his hands or feet covering his face, you’re just not going to get a great picture unless he moves. Cue: orange juice! Orange juice does work wonders here, but there is one caveat! Don’t drink it before your ultrasound. While the magic of orange juice can be a sonographer’s miracle worker, the effects are short-lived, and once it’s worn off, baby is usually done moving around for a while. The best policy for orange juice is to start the ultrasound first. Baby might already be in modeling position. Have it on hand, and you can always drink a little juice to get baby moving if he’s stuck in a bad position. We always have orange juice available for our moms in case we need it. Of course, dietary restrictions should be considered before chug-a-lugging a glass of the orange gold. More than 500 Five Star Facebook and Google Reviews! © 2014 Meet Your Miracle, LLC. All right reserved. Contact us: (844)696-2229 1305 Boardman-Canfield Rd Ste 5 Boardman, Ohio 44512 info@meetyourmiracleultrasound.com .